[QODBC-Desktop] Troubleshooting - QB Begin Session Failed. Error = 80040410, The QuickBooks company data file is currently open in a mode other than the one specified by your application. I am trying to connect to QuickBooks through QODBC using VB Demo application. I am consistently getting "80040410" error. Begin Session Failed. S0000 00000 [QODBC] QB Begin Session Failed. Error = 80040410, The QuickBooks company data file is currently open in a mode other than the one specified by your application. The 80040410 error is occurring when the company file mode specified on QODBC Setup Screen is different from Company file opened in QuickBooks. 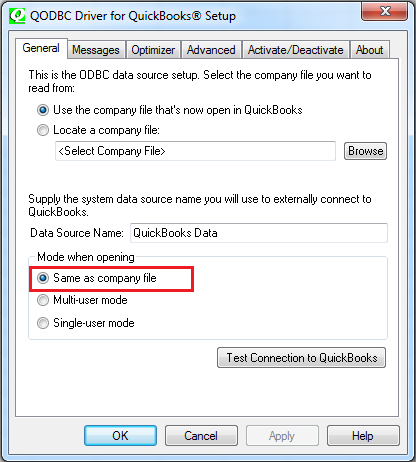 Start>> QODBC Driver for use with QuickBooks >> Configure QODBC Data Source >>Go To "System DSN" Tab >> select DSN name >> click "configure" >> General tab >> select mode when opening "Same as company file" option. After changing above settings, please open company file in QuickBooks, which you want to open & try to connect using your application.